But now on to the next of the bard’s plays that can be problematic to stage nowadays: Othello. Let’s start with what we see first: the stunning set design. Doubling as Venice and Cyprus, most set changes include a brilliant water feature that is used for various purpuses throughout the play and covered automatically when not needed. Enter Iago and Roderigo, who is portrayed as even more of a simpleton than usually, but makes for great comic relief. James Corrigan reminded my sister of a young Hugh Laurie in parts of the play. Cassio was another character that seemed simplyfied in this production, being more one-note dudebro than trusted Lieutenant who was promoted over Iago. Lucian Msamati’s Iago involved the audience as is custom for this vice-figure, but less with charm than anger (I detect a pattern there, RSC) which seemed a strange way to ‘recruit’ them. Otherwise, except for the unexplained bouts of OCD displayed at odd intervals, he was a very strong Iago, but not overwhelmingly so. 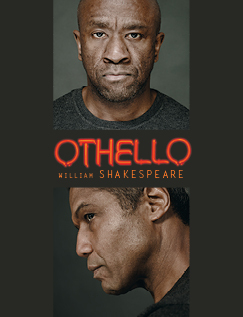 Hugh Quarshie’s Othello matched him much more evenly than I have seen in past productions where Iagos acted weak Othellos right off the stage, so this was a refreshing change. Quarshie was absolutely believable as a battle-hardened soldier and Shakespeare’s language seemed to roll off his tongue effortlessly. Joanna Vanderham’s innocent Desdemona was a great contrast to all the military testosterone, never drifting off into infantility as others have before her. After watching the broadcast, I read this was her first Shakespearean role; I would never have noticed. All in all, it was a good but sometimes uneven production rescued by the performers. It was definitely too long; I’ve seen shorter Hamlets and Coriolani that were lacking nothing, so why blow up Othello with unnecessary fillers like a ‘your mama’ rap battle that almost made me nod off? Like most of the recent RSC broadcasts, this one will not leave a lasting impression on me. I’m still waiting for them to finally knock my socks off. This entry was posted in Live Cinema Broadcast, Reviews, Stratford (UK) and tagged Akintayo Akinbode, Andrew Franks, Ayesha Dharker, Brian Protheroe, Ciaran Bagnall, David Ajao, Diane Alison-Mitchell, Eva Feiler, Fotini Dimou, Guy Hughes, Hugh Quarshie, Iqbal Khan, Jacob Fortune-Lloyd, James Corrigan, Jay Saighal, Joanna Vanderham, Ken Nwosu, Kev McCurdy, Lucian Msamati, Nadia Albina, Othello, Owen Findlay, Rina Mahoney, RSC, Scarlett Brookes, Shakespeare, The Merchant of Venice, Theatre, Tim Samuels, William Shakespeare. Bookmark the permalink.